In a small bowl combine honey, soy sauce, salt and pepper. In a large skillet, fry chicken, garlic and sauce in 2 teaspoons oil. 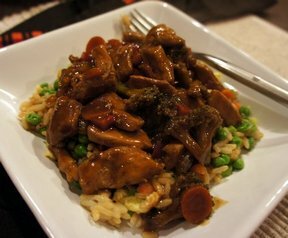 Cook and stir until chicken is lightly browned and juices run clear; remove and keep warm. 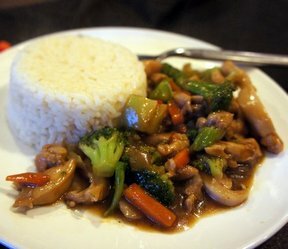 In the same pan, stir fry vegetables in remaining oil for 4-5 minutes, or until heated through. Combine corn starch and cold water until smooth; stir into chicken mixture. Bring to a boil, cook and stir for 1 minute, or until thickened. 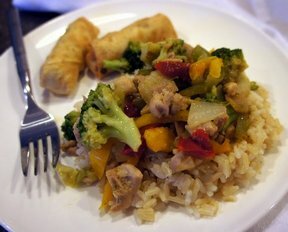 "Great flavor and super simple since you use frozen stir-fry veggies. I used boneless, skinless chicken thighs. Served it with frozen egg rolls. Perfect for church night."